The other day as I was scanning reading blogs I came across one that was a tutorial for making a fat quarter purse. Well I just had to try and I needed a new Spring bag...don't we all. Mine isn't exactly like hers since I didn't use her tutorial and winged it instead, but turned out pretty good for my first try. You can find the tutorial on Sew, Mama, Sew blog. Of course since I'm a bling bling girl I had to add the pins, which you can remove and put on other purses. Since they are just tie tack backs, I may have to make my own. These were purchased at Joanne Fabric. What I would change is the bottom, I wanted a contrasting darker color which looks good, but I think next time I'll make it come up the sides a bit more so you can see it. Also, I would add a pocket on the inside and one on the outside in a solid color as the print is pretty busy. The loops for the handles I would make a little bit shorter and I would top stitch around the top of the bag before adding my magnetic closure. Not much just little things to make it more usable. I like the size as it is about 11" across and down....now that I think of it, it is just about the right size for my little net book computer. Too bad I didn't put some quilt batting inside and it could do double duty. 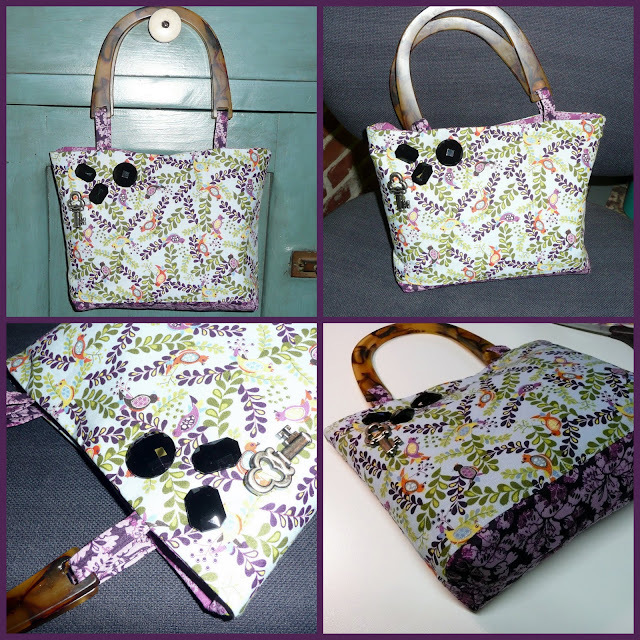 If you like bags or creating bags you might like this one for a tote bag that also uses a fat quarter. Loving that purse! I thought the pins were antique black glass faceted buttons. Got tons of them that look just like the pins. What can I say? I always have buttons on the brain! That's a pretty purse perfect for spring! Love that 'key' pin! That is such a cute bag! You are really an inspiration. I would love to start making bags. (Love your little jewellery pouches.) But where am I going to get the time!?? The days disappear and I am too tired to do anything that requires concentration! But who knows? We are going toward the lighter part of the year. Spring is soon here! Maybe I'll be able to "wing" a bag or two as well!